I was looking at some 19th century sources on goblins and fairies (basically the same thing) because Gus L's takedown of The Lost Mine of Phandelver at Dungeon of Signs is so harsh on goblins. I was trying to find some material for a different take on the goblin, when something hit me. Open any classic D&D book, from Holmes on to the Rules Cyclopedia, or open the Monster Manual for 1e AD&D. Look at Goblins. Now look one entry back (in the MM, just skip the entry for "GOAT, Giant"). That entry will be Gnomes. Every single number for Gnomes and Goblins will be within 1 point of the other. Gnomes have AC 5, Goblins have AC 6. Gnomes have 1 HD, Goblins 1-1 HD. In Moldvay and later versions of classic D&D, Gnomes have 8 Morale and Goblins have 7 Morale. In AD&D, Gnomes speak the Goblin language. In each version, we find that they even have similar (though not identical) leaders, even with similar morale boosting effects in Moldvay. Not to mention, they are both chthonic humanoids somewhere between 3' and 4½' tall. The implication should be clear: these are the same monster. I mean, what real differences are there? Gnomes have beards? Goblins are a bit uglier? Alignment? A point of AC and a single hit point? A point of morale? Gnomes are fond of crossbows? All that is minor details. Goblins and gnomes are more like each other than they are like other monsters. More important, it gives things an interesting hook. It's simple to merge the two and differentiate them by alignment and disposition. Goblins are now like gnomes but Chaotic or Lawful Evil in alignment. You can even keep the terms "goblin" and "gnome" and the respective languages. I picture the merged creatures as favoring classical gnomes. The evil "goblin" versions may be uglier because of association with Chaos, or because they live in the Dungeon-as-Mythic-Underworld, but they should look basically similar. Since goblins have an antipathy to dwarves, perhaps they don't keep beards, but I think visual cues should be subtle to make the merger meaningful. Twentieth century fantasy literature drew extensively on the fairy tales collected in the 19th century. These were far from precise in terminology. "Goblin" is one of several catch-all terms that referred to pretty much any of the diminutive, chthonic creatures, whether we are referring to mine spirits such as the Welsh Coblynau or domestic brownies. "Gnome" isn't any different. The idea that gnomes are somehow separate is an invention of Gygax. Once you recognize that goblins and gnomes are the same monster in D&D, a few things happen. First, the dynamic of encounters with short humanoids will be different. Just because a creature is about 3½' tall, doesn't mean that it is always good or evil. This creates an ambiguity that games with short humanoids otherwise lack: you can no longer tell at a glance whether a creature is a friend or foe. Second, the idea that gnomes have an affinity for illusions is a natural fit for goblins. It's a downright nasty twist to add goblin spellcasters with access to Phantasmal Force. A goblin lair is a dangerous place, and adding illusions can give them some bite. It becomes a place where you cannot trust anything, which adds a distinct layer of classical fairy lore. If the idea doesn't appeal to you on its own, watch Jim Henson's film Labyrinth. Third, it justifies the existence of gnomes. As written, there's no reason to ever use gnomes. You can always do the same thing with dwarves or halflings, and do it better. But once you make gnomes and goblins the same monster, there's a reason to put them in a dungeon. Neutral gnomes/goblins are a great faction to add to the dungeon mix, with just enough potential for nastiness to make them interesting. 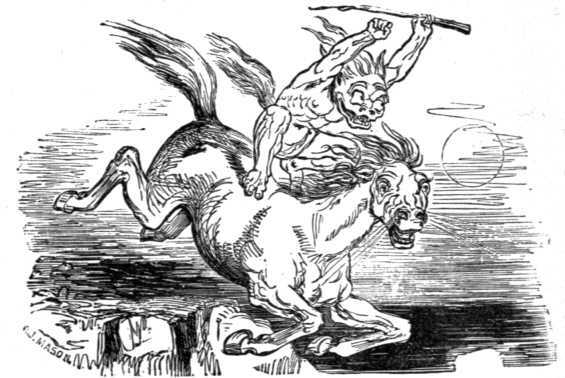 Fourth, there is a great amount of 19th century folklore that works with this view of goblins/gnomes as chthonic fairies. For instance, British Goblins by Wirt Sikes is a good guide to Welsh fairy lore, and the merged creatures that we get from goblins and gnomes can fit a lot of the stories within. 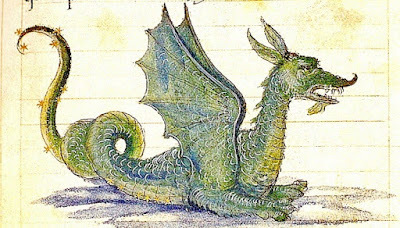 The Coblynau (Welsh mine-spirits) are one of several examples of creatures that can be used as inspiration for gnomes. The pranks and demands of British goblins are good ways to make goblins more than one-dimensional bags of HP to be killed. I think this is a simple solution to a dilemma that I've seen in OSR circles for years now. There is a need for straightforward dungeon factions in the best tradition of B2 Keep on the Borderlands. 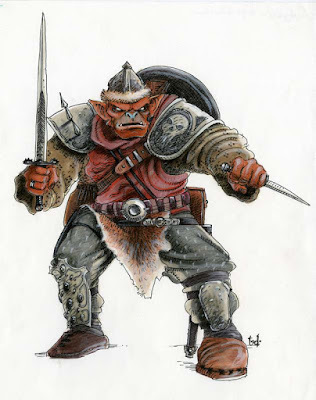 But after 40 years of the goblin being abused as an entry-level monster, there is some understandable goblin fatigue. This brings them close to their folkloric roots and I think changes the way things work without losing an iconic monster to overuse. 2015 is coming to an end, and that means it's time to think about what happened this year and what lies ahead for old school gaming in 2016. Metamorphosis Alpha is the big revival of the year. Going from a couple of stray releases to a full-blown product line is impressive. The MA renaissance will continue next year when Epsilon City is released. Our stout Warden commander, Jim Ward, got through a rough bout in the hospital and had a successful Gofundme. Deluxe Tunnels & Trolls also hit this year, a significantly expanded and updated version of the T&T game. The big intriguing question for next year is what will happen with Runequest 2. The republication of Chaosium's classic RQ rules is wrapping up a very successful Kickstarter campaign with promises of it becoming, once again, a full-blown campaign line. Tied directly to Glorantha, this effectively puts the kibosh on decades of attempts to make RQ generic, and also has promise to make a classic rule set a major part of today's RPG scene. Part of its interest is that RQ is deliberately not Gygaxo-Arnesonian fantasy. Consider something. Between online print-on-demand releases and reprints, it's been possible over the last few years to get OD&D, AD&D, T&T, Metamorphosis Alpha, Empire of the Petal Throne, Traveller, many Judges Guild products, and next year Runequest legally in their unadulterated original forms. Effectively the way people gamed in the 1970s is immediately accessible. That's not an unimpressive feat. I think the OSR has had a wide impact in this, and it's something to enjoy. Goodman Games is in fine fettle. They released a Monster Alphabet that was almost a side question to their constant flow of Dungeon Crawl Classics products and their wave of reprints. DCC has brought the boxed set back with Chained Coffin and Peril on the Purple Planet, and is about to go to new levels of excess with the 4th printing. Joseph Goodman has found a niche, found its spending level, and is pushing its buttons like a maestro. The up and comers are worth talking about. Autarch, whose saga with Dwimmermount threatened to delay its Adventurer Conqueror King, released an excellent sandbox module with The Sinister Stone of Sakkara and is putting forward a Lairs & Encounters book in Kickstarter that promises awesome stuff. These guys are hitting their stride. White Box is also having a day in the sun as a highly adaptable platform, with White Star and White Lies released this year and more to come. It's far from perfect but has created a flurry of activity. S&W White Box is also back in active and solid support. My hope is that this is more the legacy that Swords & Wizardry has rather than as a kid sidekick to Pathfinder for Frog God's releases. Lamentations of the Flame Princess rocked the world by winning ENnies and then failed to release anything new other than T-shirts. Which means that 2016 is primed to be an absolutely humongous year again. The number of products that Raggi owes everyone is high and the individual projects are promising. Also, Geoffrey McKinney is going to release four hexcrawl modules for his excellent Carcosa setting around Spring 2016. Geoffrey's new work will be AD&D compatible. 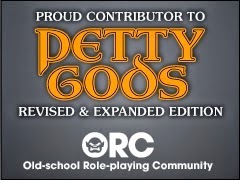 Several companies, including Goodman and Frog God, have tried to make old school 5e happen. Nobody's made any splash whatsoever. FGG's books (Quests of Doom, Book of Lost Spells, Fifth Edition Foes) are quality but haven't created a distinct space. Neither have Goodman's Fifth Edition Fantasy modules. They sell but are sort of absorbed in the generic 5e 3PP space, which is primed to be won by products from people like Sasquatch Studios and Kobold Press. The "O5R" is effectively on life support. This year's big winners, though, are small presses doing their own thing via Lulu and OneBookShelf (DriveThruRPG/RPGNow). Yoon-Suin is hands down the best old school product of the year, and Fire on the Velvet Horizon is a full and worthy answer to the gauntlet that Zak S. threw down with A Red & Pleasant Land. Richard LeBlanc (Creature Compendium, Basic Psionics Handbook), Simon Forster (Book of Lairs), Kabuki Kaiser (Castle Gargantua) and the White Box crew, particularly James Spahn (White Box Companion, White Star), have been crushing it. I am really impressed by the work of all these people and a half-dozen more, and I'm extremely pleased that DIY self-published products managed to take the initiative in a year that easily could've been under the shadow of 5e and LotFP's mega-year in 2014. The Zines keep coming too. This has been a fun year, including the innovation of the one-page zine. It's still mostly clustered around the same suspects as last year, but there have been a few additions. I keep a collection in Google+ called Zine Alert! that people should follow. I have a standing personal policy to both buy and promote any handmade old school zines offered, so if you plus me on the post or message me with it I'll spread the word. The old school gaming scene rocked in 2015. Personally I got to play MA, OD&D, B/X D&D, Lamentations of the Flame Princess, and DCC RPG. Hopefully I'll be able to add White Star to that soon as I'm rather jazzed by the recent Star Wars film. 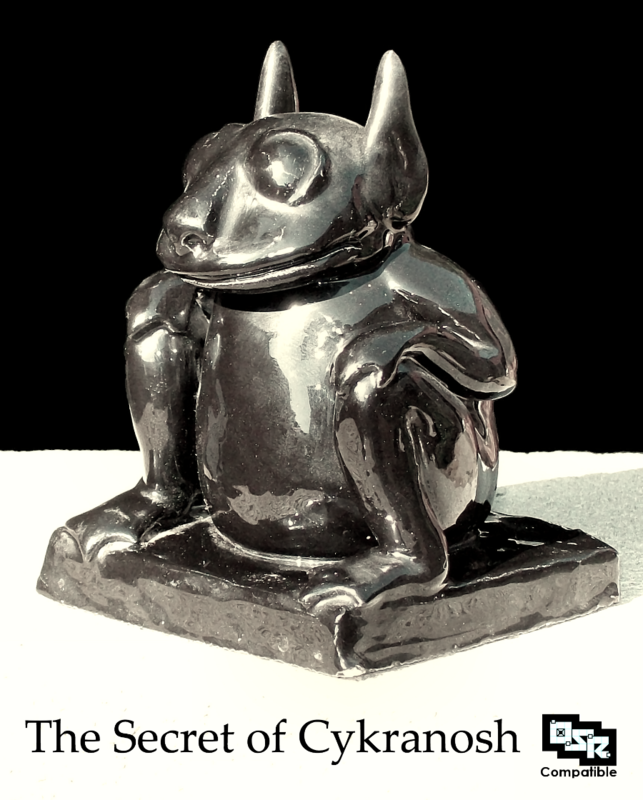 LotFP set the bar high in 2014, and I think small press and DIY rose to the challenge admirably. I hope to see more like it in 2016. Good gaming! 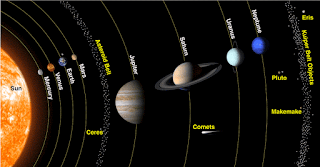 Much more of Appendix N occurs within the Solar System than people commonly think. A significant chunk of the Appendix is what I would call antediluvian fiction. This is works that occur ostensibly on Earth, but in an age before known history. Presumably the future of these settings is some cataclysm that results in the modern positions of the landmasses. This may not be the flood of Genesis, but it may as well be; and "antediluvian" generally fits the world view of these works. These include significant influences on D&D such as R.E. Howard's Conan series and J.R.R. Tolkien's Hobbit and Lord of the Rings, all works that were meant to happen on our earth. Dunsany's The Gods of Pegana also fits in this category. Following this is historical fantasy. There are elements of this in Anderson's work, Lest Darkness Fall, the earliest Fafhrd & Gray Mouser story ("Adept's Gambit" is set in Tyre, not Lankhmar), some of Norton's fantasy work and most of the Swords Against Darkness stories. There are also elements of historical fantasy in Merritt's The Ship of Ishtar. Howard wrote historical fantasy as well. Then there is modern fantasy. Burroughs (Tarzan and Pellucidar), Merritt, and the Lovecraft stories not set in the Dreamlands are all contemporary. So are Wellman's Silver John stories, or some of Howard's writing such as the El-Borak series. Following this are the two flavors of future fantasy set on our earth. Post-apocalyptic works cover entries such as Norton's Daybreak 2250 AD, Lanier's Hiero's Journey, and St. Clair's Sign of the Labrys. Were that not enough, dying-earth works such as, well, The Dying Earth and World's End are set far, far in the future. This motif recurs in the Hawkmoon series by Moorcock and the Book of Swords by Saberhagen. The next ring is the planetary stories, which any reader will know are dear to my heart. Burroughs and Brackett and Weinbaum all wrote compellingly of Mars. By a weird coincidence, neither the planetary work of Lin Carter (Jandar of Callisto) nor of R.E. Howard (Almuric), both set outside the Solar System, are mentioned in the Appendix. The last group are set in worlds explicitly connected to our Earth. The fantasy world of Three Hearts and Three Lions, that of The Compleat Enchanter, the Elfland of The King of Elfland's Daughter, Leiber's Nehwon, Moorcock's Eternal Champion multiverse, the world of Blue Star are all at one time or another either sending people or ideas to our world. Almost none of Appendix N is set in a "proper" separate fantasy world like those often seen in D&D. Yet the default assumption of so many games is exactly that, of a world disconnected from ours but somehow similar in major ways. At best there are hints that it is either a far-future post-apocalypse of our world or an antediluvian version of it. This is a thing that bugs me the most about great chunks of D&D and similar fantasy. I don't think it's an accident that so much of this work keeps ties to our earth, whether for reasons of myth, or details, or a touch of irony. It's deeply weird that a game where, for instance, The Moon Pool is meant to be a significant influence, we so rarely see PCs like those in The Moon Pool, who are closer to Call of Cthulhu investigators than D&D PCs. I ran my first Dungeon Crawl Classics RPG funnel today, and four out of eight PCs met their ends in the process. The Kraken picture above is actually representative of the first encounter, where the ship the characters had signed onto was attacked by a giant sea monster. The PCs only had to beat back the tentacles, which still took a couple of characters. Then they rowed the two ship's boats to a nearby island as the ship started sinking, only to be taken down by the squid. On the island the players actually took with gusto to surviving the night, which was one place that the funnel format showed off a wrinkle I hadn't thought of: a weaver was making a lean-to, an indentured servant starting a fire, a potato farmer finding edible tubers: characters doing survivalist stuff with the funnel skills. If you wanted to do a Swiss Family Robinson or Lost multi-part scenario in a fantasy RPG, a DCC funnel is actually a pretty great way to start it. Especially when there are a lot of interesting factions on the island. But my scenario focused on a ziggurat at the center of the island, where things led. After a lizardman attack in the night, the characters went to the step pyramid and explored. Eventually they found a giant lizard, which took a PC out. But they found a back way down and a series of chutes that, carefully explored (though still losing a PC to a spear trap), led to an uncanny room that turned out to be a buried spaceship. I've been wanting to use one for a long time, and this one took off once the PCs sat in the command chairs. As of the end of the scenario, they were level one PCs en route to Mars. 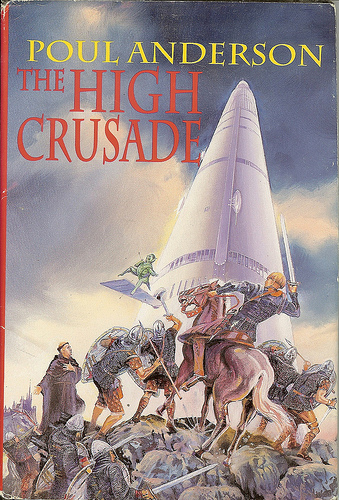 The overall campaign setup is one I've wanted to do for a while, basically a mashup of Poul Anderson's The High Crusade with the classics of planetary romance. Crusade is science fiction where a group of English peasants commandeer a starship and get on with conquering alien worlds. Anderson's book is pretty much a romp for the humans, but I just want to take the basic image of medieval pseudo-Europeans with a starship and run with it. As a classic concept I just don't think it's done enough. 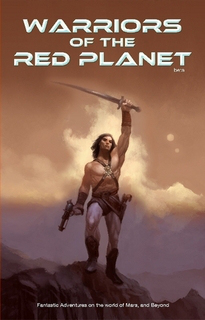 Adventures beyond this one are going to be using the Warriors of the Red Planet RPG as a supplement for Barsoom material. It's a retro-clone type of game by Al Krombach that provides a thorough D&D-alike conversion for the Edgar Rice Burroughs Barsoom with the serial numbers filed off (or at least down to a near-rhyme; I mean, the sample character is Pars Parthas). But it will be using the DCC RPG, which I think is a good fit for sword & planet type adventure. Beyond Mars / Barsoom, there are many worlds I'd like to explore in broad strokes. Venus, of course, with others in the solar system; and maybe even savage Almuric, the Purple Planet and its weirdling sun, Jorune, and frozen Yuggoth and dim Carcosa. Really, the only problem is picking where to go first. This is a long list of products that I have either bought or have a PDF from, and have curated into a list of goodness. There is a code through 11/26, TURKEY30, for 30% off, and I want to highlight some products before the holidays. One of the two best OSR products on Lulu in 2015. Yoon-Suin is a bunch of tables and ideas for running a sandbox campaign with some unique flavor. Scrap Princess and Patrick Stuart, Fire on the Velvet Horizon. The other best 2015 product. A statless monster manual full of inspired weirdness, in the style of an old zine done by pasting together. Richard LeBlanc, CC1: Creature Compendium. Simon Forster, The Book of Lairs. A neat book of the type I've wanted for a while: just a collection of wilderness monster lairs. Each lair is a compact but usable mini-dungeon that you can put in a hexcrawl. Those four are the best new Lulu-content over the past year, and all are well worth getting. I also would be remiss if I didn't do a little self promotion. Dungeon Crawl #2 and Dungeon Crawl #3 are still available on Lulu, as are two projects I was proud to contribute to: Narcosa and Petty Gods. Narcosa particularly is a beautiful book of literally trippy weirdness, and PG is a wonderful tome. I ran OD&D today. It seems odd, given a wide array of systems – including clones – to still use the original booklets to run games. 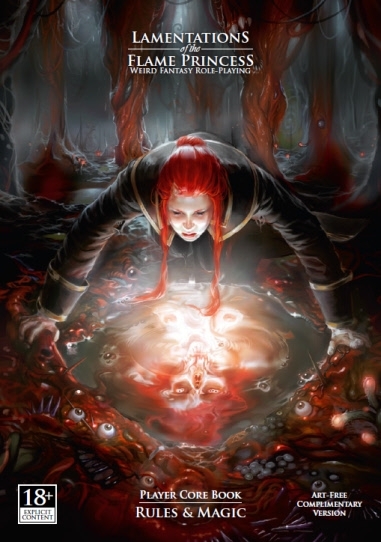 I did recently give Lamentations of the Flame Princess a whirl, and it's a fine clone. And yet I now feel like OD&D is my "home" system. The game used Dyson Logos's Dellorfano Protocols Map. I loaded it with an adventure that had some plot behind it, a portal leading to Cykranosh (the Clark Ashton Smith name for Saturn), a few other CAS references, a few monsters, and a couple of interesting tricks. It was a ball to run. Using OD&D plus Greyhawk as a basis winds up a lot like AD&D lite, or an alternate version of B/X D&D. But I like this particular iteration's quirks the best. It was how OD&D was really played, and it hits a sweet spot that attempts to add more detail or systematize things wind up missing. There is a comfort level to it, but a big factor is that it doesn't feel as much like somebody else's game. That's the main weakness, in my opinion, of the various clones. As a side note: I think the best thing that you can do for your D&D experience is to run original D&D, no supplements, at least once. It's like a Zen cleansing moment for D&D: you just get to focus on the dungeon crawl itself. 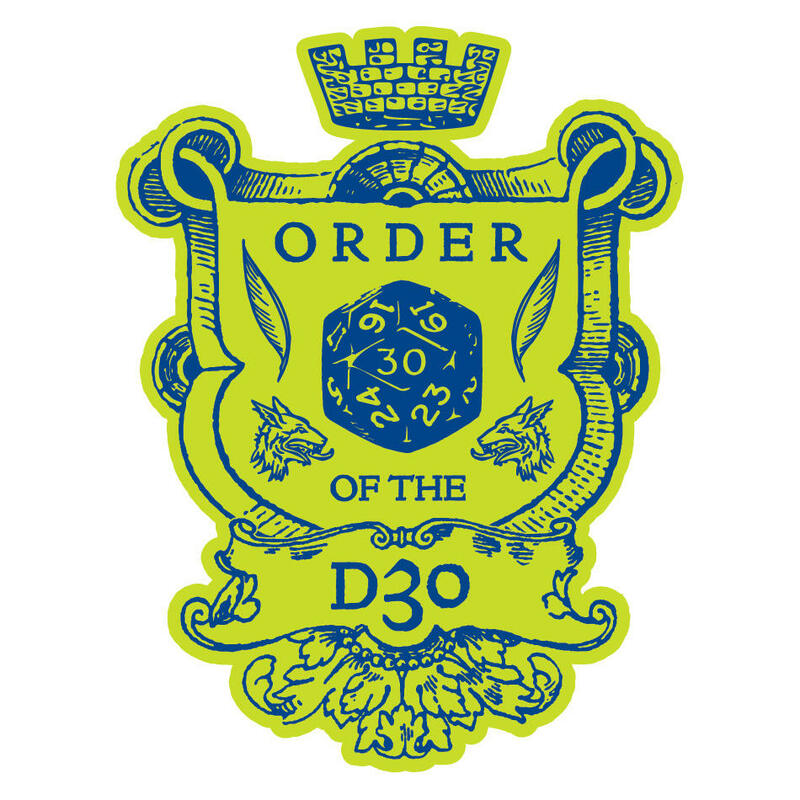 My love for OD&D I think stems from that. Everything I add, I choose to add, for a specific reason that I understand. I also used the Arduin Grimoire, which I've been consulting for its quirky-as-hell critical hit table for a few games. It's a frickin' riot in use. One of the PC hobbits got a result of "eye" against a bandit with a dagger, and the damage was enough to kill the bandit straight out, so I described the hobbit getting up on top of the bandit and jamming the dagger home. I'd actually like to see a book like Arduin but designed by a person with better rules-sense than Hargrave, and less of the stupidly complex charts like individual weapon damage by number of enemy HD. And of course the Ready Ref Sheets were in hand. It's another product I love but would appreciate a new version for. I'd like a to-hit chart closer to the one in Iron Falcon, which has additional gradations by level, and a fresh dungeon searching table. And of course various and sundry other charts. My feeling is that D&D is an intensely personal game, being a creature of imagination. So it's naturally going to wind up as a kitbash game, where you take from the variants and other games out there and construct your own. Other people have talked about how they're running an "OSR Frankengame" and I think that's educational. The best thing the OSR has done is put out an awful lot of material for kitbashing. No one piece is a sine qua non, but there's plenty out there to tune a game just the way you want. 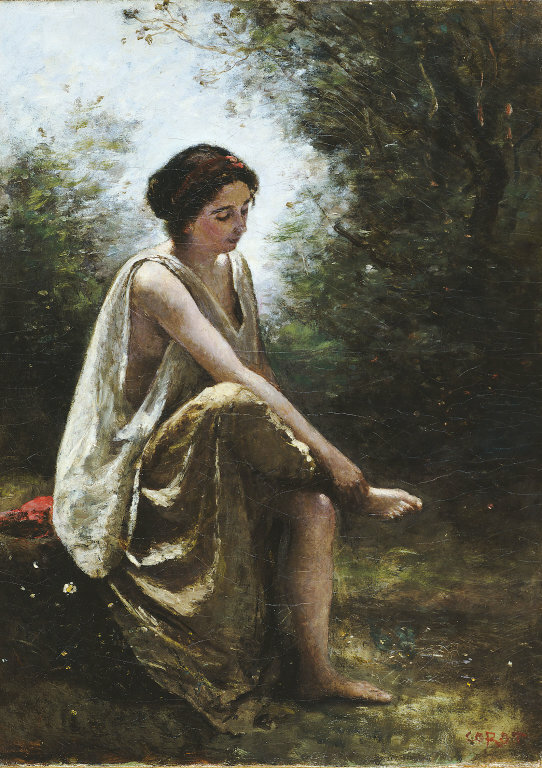 Continuing with the theme of classical myth, Eurydice was a wood nymph (or possibly a demigoddess) who was married to Orpheus, who was the greatest musician and poet ever born. (He was also possibly a demigod; there was a lot of that stuff in classical myth.) She was bitten by a viper, and died. Orpheus, then, followed Eurydice into the underworld realm of Hades, where he found Eurydice. His music was said to be so piteous that Hades and Persephone permitted him to bring Eurydice out of the underworld and back to the world of the living, but he was to walk in front of her and not turn back. But as soon as he reached the outside world, he turned around; Eurydice had not yet left the underworld, and was lost to him forever. He eventually was killed by women in a Dionysan fury. The story is one of the great tragedies of Greek myth. In D&D terms, of course, he should have just had a friendly cleric cast Raise Dead. We talked in the Persephone entry about people belonging to the underworld, so I won't repeat that part. I do think it's worth underlining how final death was in Greek mythology; there was no easy way back, and even the gods would intervene to keep their favorites alive (think of Athena and Odysseus). It is somewhat cheapened when any cleric with access to fifth level spells can pop dead Eurydice back. The basic frame of the story, of going into the underworld on a perilous quest, is of course inescapable in D&D. It's the whole point. Getting back out safely is, of course, an exercise in ingenuity (and sometimes luck) for the player. 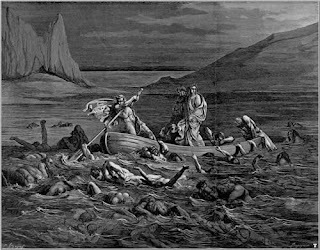 The landmark of the underworld in Ovid is the great river Styx. 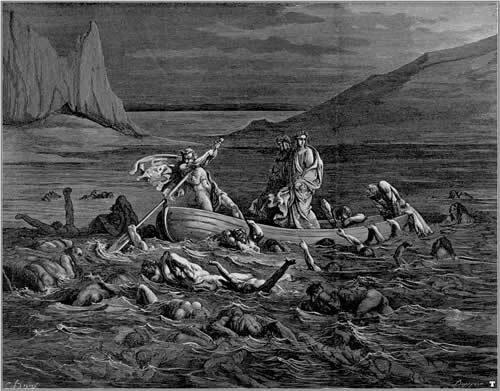 It was this river that was supposed to have given Achilles his power (and the vulnerable heel that he was dangled by), although it is notably not the river navigated by Charon; that was the river Acheron, although Ovid still mentions a ferryman. Still, the idea of a river bounding the underworld has a lot of potential. If you are using the mythic underworld concept in your dungeon, an underground river or a gate (Ovid mentions the gate at Taenarus) is a terrific way to convey it. Having such a boundary makes it a definite choice for the characters to cross into the realms below, and allows you to incorporate areas such as the basement of a castle that is "just" an underground location and not part of the underworld proper. The rules that Philotomy discusses, such as doors remaining stuck or monsters wandering the corridors, only apply once you have crossed the Stygian border. There may be consequences or challenges for taking something out and into the broader world. One aspect of the Eurydice story that I love is how the rulers and inhabitants of the underworld are moved by Orpheus's song. Ovid is quite explicit, describing how the famous inhabitants of the underworld such as Tantalus and Sisyphus stop their efforts as they hear it, and even the Erinyes (Furies) are brought to tears. A genuine sense of aesthetics and taste in its denizens is generally under-utilized. Evil is often aesthetically "ugly" and unappealing, and that has overall been the trend in D&D. But it isn't necessary; the underworld can contain and appreciate beauty, even if in a dark and twisted way. You can read the "music tames the savage beast" into this, where particularly beautiful offerings might be useful for negotiating with underworld entities. One other rabbit hole that can be gone down with Orpheus and Eurydice is mystery religion. Orpheus is closely linked with the Orphic Mysteries, a well-documented early form of the mystery cult. Initiates were taught rites and rituals that had a secret mystical meaning, and we have several surviving Orphic hymns. These are poems, attributed to Orpheus, that contained detailed information on the mythological world. This strikes me as a fertile religion for a fantasy world; its initiates form a secretive group, and it represents a way of thought that is different from modern rationalism in an interesting way. We'll leave Orpheus looking back at Eurydice. For the curious, I also intend to look at Odysseus and Heracles within the realm of Greek myth, and getting into Egyptian and Norse myth. Any thoughts on other mythology to approach would be appreciated. This is the start of a new series inspired by the discussion several years ago by Philotomy on the Dungeon as a Mythic Underworld. To boot, I am going to be talking about ... the underworld in mythology, and its implication on Dungeons & Dragons and similar games where characters go underground to seek treasure. One convention: in these posts I'm going to use the Greek names for deities, even when the Roman names are better known. 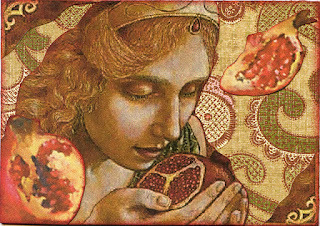 In the short version: Persephone was a goddess of nature and flowering plants. She was abducted by Hades, god of the underworld, who burst forth from a rift in the earth. Her mother, Demeter, eventually convinced Zeus to send Hermes to retrieve her. However, she had eaten either four or six pomegranate seeds from a fruit offered to her by Hades, and the lord of the dead was able to claim that each year, she must spend an equal number of months as his queen in the underworld. This was a transparent explanation for plant growth in winter, which is alternately described as either Demeter's sorrow for her daughter in the lost months, or the effect of Persephone's simple absence. But that's not really what I think is interesting in this myth. Rather it's the idea that things in the underworld can permanently change a visitor. A literal interpretation of the Persephone myth takes us to an interesting sort of "special" in a dungeon chamber. A table is laid with exquisite food and drink, but drinking it places the characters under an enchantment specific to the underworld. For instance, they might fall under a powerful wizard's Geas, or any command or curse type of effect, and optionally the amount of food eaten might be proportional to the price taken. This is suitable for any food coming from the dungeon, or perhaps any kind of "garden" sub-area, et cetera. Hewing still closer to the Persephone myth, one possible consequence is an impressment into service within the dungeon. A character might not be the "queen" of the underworld – Persephone was a goddess, after all – but they might have to help build out a new sublevel, or maintain and clean traps, or guard against intrusions by other parties, et cetera. Of course this has the potential to thoroughly hijack a campaign. This sense of corruption can be signaled in a lot of different ways. Perhaps the coins, instead of showing good and wise kings, are transfigured into the faces of wicked tyrants; instead of portraying the lawful and virtuous gods they now portray leering demons. Metal implements such as iron spikes left too long in the dungeon might take on a sinister patina, or wooden ones growing dark and twisted where once it was straight and true. As the PCs delve deeper, the dungeon can subtly make them its own. When they leave, perhaps, or if they are foolish enough to overnight underground, they can have vivid dreams of the underworld passages, ending just before their bloody death. A low Constitution PC might pick up a lingering cough or chill that marks them, or the PCs' faces might take on the cast of the dungeon's unhallowed darkness. Of course, the end stage of this is the Innsmouth effect - where the PCs become fully monstrous. This should be preceded by both PC choices, and some kind of warning effects. Perhaps drinking from mysterious pools and fountains has a temporary helpful effect but slowly changes the characters; they might get infravision, or the ability to open stuck doors, without the normal hassles assumed by the D&D rules. But there needs to be a way to reverse or turn back from this course. It's worth thinking about having the PC "go monstrous" at certain intervals, like in lycanthropy, so they don't experience it all at once. The story of Persephone was a myth that deeply affected me when I read it as a kid. I've always felt that the idea that you make one mistake and now belong to the underworld is one of the more chilling ideas in mythology. So naturally I see it as a key building block if you want to make your dungeons mythic. Ah, Stonehell. The picture of the stairs got me thinking. 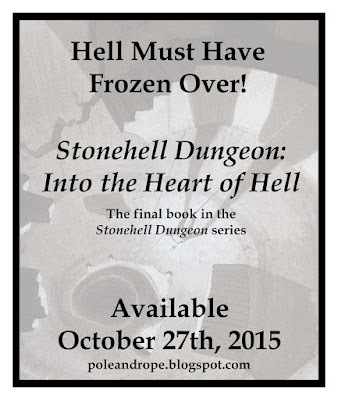 If you can't see that for some reason, the second book of the Stonehell megadungeon is coming out on October 27. That is awesome, and I want to talk about it a bit, having run the first book for a number of sessions and thought about what could be done better. 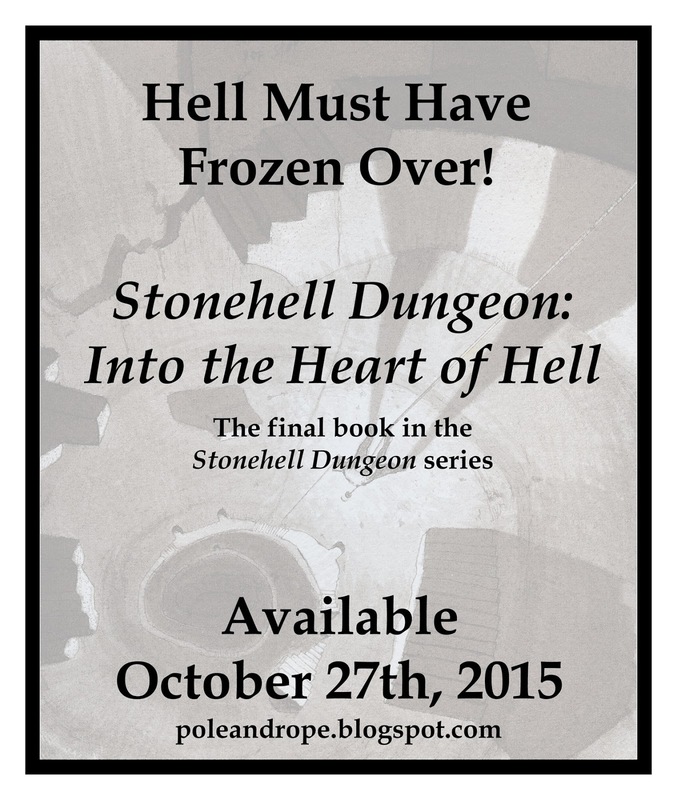 Presumably Stonehell Dungeon: Into the Heart of Hell will be available both as a PDF and in print-on-demand. I'd recommend getting the PDF (volume 1 PDF), because you can't really run a megadungeon from a perfect bound book. Also make sure you get Supplement One and Supplement Two. I have had some ideas since I ran it on how I'd actually want the book presented. This is how I'd recommend preparing and running the dungeon. First, there's the physical preparation of the materials. I'd recommend printing the front matter, the master maps, the monster lists, and the sublevel descriptions – but not the sublevel maps and keys – in a big spiral-bound book. You can get the print-on-demand versions, but a single spiral bound book is going to be easier to reference. Then get the appendices printed on good cardstock, so you can reference them frequently. Then get the two-page spreads printed out on sheets of white 11"x17" cardstock, so each sublevel is one big spread that you can reference while running the game. Second, go through the sublevel keys with two highlighters. Find every monster and highlight it with one color. Find every treasure and highlight it with the second color. You will want to be able to tell at a glance what is in a room. Third, get a copy of B2 Keep on the Borderlands. The entrance to Stonehell is located in a canyon almost identical to the one housing the Caves of Chaos in B2. The titular Keep is a solid home base for adventurers, and the wilderness map is perfect for an expanded version of Stonehell's surroundings. the Dragonsfoot index to B2 contains an overwhelming amount of writing that has been done on B2. The Zenopus Archives resource page is a more compact guide, and The Project on the Borderlands is a solid set of enhancements. Fourth, dig in and make it navigable. As you get familiar with the dungeon, create maps (which may be partly inaccurate or out of date, see the sixth point below) and write out directions that monsters or NPCs can give to PCs. Add in some extra treasure (Stonehell is pretty stingy with the gold stuff) and sprinkle in hints about where it is. The goal here is to encourage play that goes for bigger treasures rather than blundering through every room that Stonehell has to offer. You may want to also discourage players from taking a "typical" bash-in-the-door approach to areas such as the Quiet Halls or Kobold Korners (or later, Monster Dorm) as this can turn into a grind. Fifth, make it your own. Stonehell is a campaign, not a few sessions, and it cries out for a referee's individual stamp. It needs more treasure, it needs more weird monsters, and it needs sublevels. Take either material you've written, or from other modules, and steal it for Stonehell. 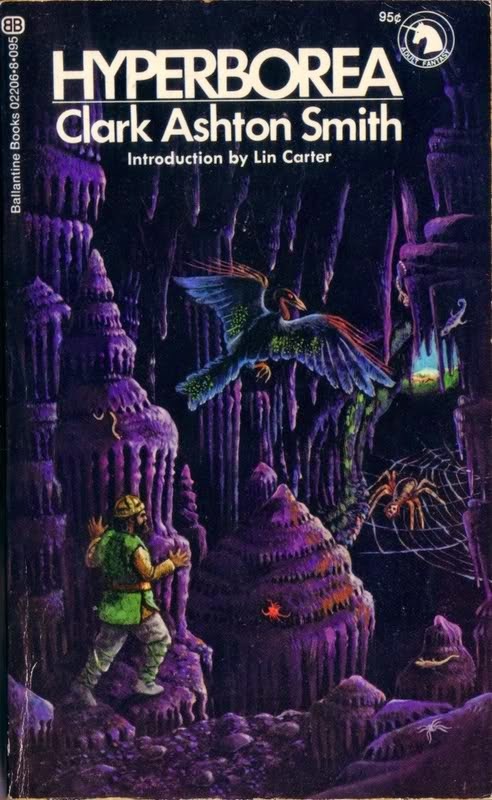 If I were to run it again, I'd work in a lot of material from Geoffrey McKinney's Isle of the Unknown and Dungeon of the Unknown. It's fresh, distinctive material that contrasts well with the classic D&D feel that is abundant in Stonehell. Just one example: the "dragon" in level 1A could easily be creature C11 in Dungeon of the Unknown, which has a "breath weapon" consisting of razor-winged butterflies; that would totally change the complexion of the encounter. You can hang a lot of other material on what has been written here. Finally, make it a living dungeon. The kobolds are a great mechanism for doing this. Throw up "under construction" signs, block off passages that PCs have previously taken, and create a roster of new monsters to move into areas that have been "cleared." Slap fresh coats of paint or have a slime monster create a tunnel that wasn't there before. Especially when PCs choose to spend time away from the dungeon, it should not be the same place when they come back. One side note: while Stonehell can be run reasonably well in pretty much any system you like, it pays to have a copy of Labyrinth Lord handy, just for reference to the monster descriptions. Stonehell's stat blocks are tight, but they don't list out any special abilities of the various creatures. B/X, and hence Labyrinth Lord, critters are a touch different from those found in non-B/X derived games. Stonehell is a neat place, and if the first half is any indication the full thing will be worth the work. Michael Curtis has created a huge, coherent dungeon that is a solid basis for a D&D campaign. But it needs to be treated as a collaborative effort; the very style of a megadungeon campaign deserves no less. One of the great creative leaps of the 20th century came from a student at the University of Minnesota who worked part-time as a security guard. He drew together wargaming, Diplomacy-style gaming, and improvisation into a single game that people haven't stopped playing in the forty-plus years since. Today would have been Dave Arneson's 68th birthday, which only brings home how young he was when we lost him. His work with Gary Gygax on Dungeons & Dragons is practically legend. You can read the important bits in Playing at the World, although like most histories it winds up focusing on Gygax's larger than life personality. Dave's spirit is subtler and harder to find, especially with how much time Gygax had to leave his mark. Ghosts cannot be killed. 1 ghost per person or thing killed in expedition total. Have human sacrifices every 30 days. Are able to paralyze all mortals by presence. Magic armor and super heroes and wizards on affected. An area of noxious fumes and bottomless pools caused by some natural phenomena where it is, of course, rumored that a gate to Hades is located. It is also rumored that some horror inhabits the area that has been cast out of Hades to attack the unwary or guard some treasure. The difference between Arneson's dungeon maps and Gary Gygax's fascinates me. Arneson focuses on weird, lengthy corridors, occasionally huge rooms, but mostly small chambers and hallways. (Room 9 at the top has a total of 60 goblins - tight quarters!) It feels much less "crowded" and each room can be totally purposeful, while the dungeon as a whole is instinctively nonlinear and interesting to explore. Arneson's work is perhaps less systematic than Gygax's, but it seems to me to more deeply evoke an imagined world. Of course, this is also a man who lists robots under "Magic Items," so how could his work not be close to my heart? I've thought a lot about what an Arnesonian game is, and the ideal system for it. Arneson probably had some rules behind it, but as Mike Mornard has put it in his call to BE A FKR! (Free Kriegsspiel Renaissance), it strikes me that the actual system run by Arneson was a type of Free Kriegsspiel, a wargame where the referee created rulings on the fly, run within a rough framework outlined by Chainmail and the First Fantasy Campaign. PCs aren't classes; they're flunkies who start out as zeroes and grow through combat and survival, and become major players in the setting. So the next time you run a game, give a thought to Dave. He ran some great games, and it's worth getting a bit of his spirit and boundless creativity into your own. So there's this game you may have heard of called Dungeons & Dragons. It seems to have more dungeons than dragons, which is a shame. Ancient and medieval depictions of dragons aren't of multi-story lizards breathing out gigantic fireballs. They are generally small, more slender reptiles, comparable in size to large horses, that seek out treasure hoards and guard them. It's a classic underworld trope to have dragons atop a burial mound or ancient tomb, which makes them a natural fit for dungeons. Dragon inflation has been a constant of D&D, and it has slowly pushed the dragon out of the game, except at high levels. Dragons went up in hit points significantly in the first edition PHB, and much further in second edition, firmly ensconcing them as upper-echelon enemies. They have stayed that way ever since; a party will pretty much have to be 5th level or higher before even thinking about slaying a dragon. OD&D dragons aren't unbeatable super-beasts. White dragons only have 5-7 hit dice, and are 25% likely to speak, and 60% likely to be sleeping when encountered. A Very Young white dragon only has 5-7 hit points and a similar score on its breath weapon; in my opinion that's not out of the question for an encounter on the first dungeon level. It's a logistical challenge, since the party will want to avoid being hit by the breath weapon, but not one that the party can never overcome. Even at 3 square inches (30 feet), the cone of a white dragon's breath will not necessarily hit multiple party members if they arrange themselves properly, using terrain obstacles or shapes to their advantage. If nothing else, they won't just assume they can kick in every door and slay the monsters. All OD&D dragons are treasure type H. This is a hoard with literally piles of coins; there is a 75% chance of 10,000-60,000 GP. On average (and not counting magic items), a hoard should be in excess of 80,000 GP, with most of that coming in jewelry and gold pieces. Slaying a dragon and taking this much treasure would be a fine haul, although the reward stops being quite so dramatic after 5th level, when a dragon's hoard is no longer an automatic level gain. But up to level 5 or so, dragons are an efficient way to gain a level. If you want to picture a hoard, let's say that gold pieces are about the size of a Krugerrand. 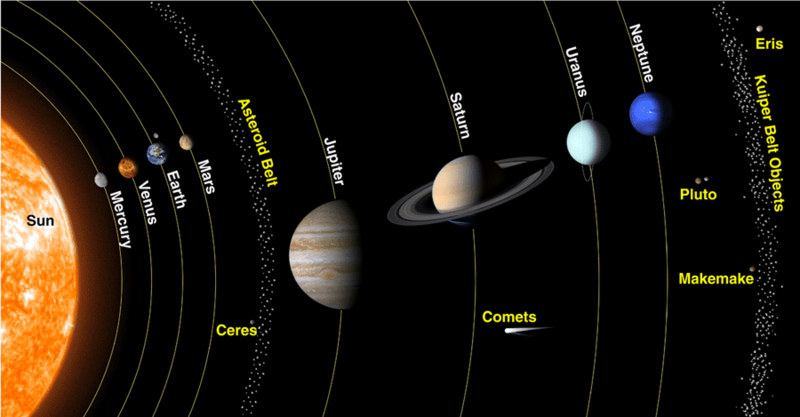 60,000 gold pieces would be about 50 gallons of space, which would be larger than the volume of a typical bathtub. This would have about 25 pieces of jewelry and/or 50 precious gems mixed in. Armored PCs could only take out about 1800 coins each; you'd probably want a few wheelbarrows. Transporting gold out of the dungeon should be almost as much of a challenge as slaying the dragon. It's impressive, but not cavernous rooms full of coins. The largest possible hoard would have 184,000 coins, which is in the area of a refrigerator. By design, dragons should be a low to mid level monster: a hard challenge at level 1 or 2, but able to be handled with much more ease at levels 4 to 6.. If the referee is running OD&D by the book (as it were), it's a poor decision to take on a blue or red dragon. They are more likely to talk, and thus to parley, and less likely to be sleeping. And their treasure will be the same as a white dragon, which could be as much as 6 hit dice lower than its red cousins. There's another reason to put dragons in your dungeon, though: factions. Dragons will naturally relate to the other denizens, although obviously this relationship may be more of a predator/prey one. But it will always make the dungeon more interesting if there is a dragon sitting on a big treasure hoard. Whether or not the dragon talks is a big factor in this, as a brute white dragon that picks on the goblin tribe would be very different from a crafty green dragon that has a group of gnolls or bandits doing its bidding. The moral is simple: don't be afraid to add dragons to your dungeon. They are designed in OD&D to be things that you can handle but still have some "badass factor." Barnes & Noble has two $10 volumes that between them print the first 5 Mars novels, which have gone into public domain. A pretty good deal overall, although there is no art. A single volume from the Conan series sits on the shelves. The other Del Rey volumes have all disappeared. Huge collections, including from Penguin and Barnes & Noble. There are also multiple anthologies of short stories similar to Lovecraft's. Not Elric or Hawkmoon, but Corum is actually being reprinted. There are two shelves full of Tolkien. This has been pretty much a given for the last twenty years or more, as long as I've been reading fantasy. George R.R. Martin is the only comparable author in terms of shelf space. Assiduous hunting in the anthologies revealed that one of Vance's stories is in a The Best of Fantasy & Science Fiction volume. The Dying Earth proper is gone from shelves. 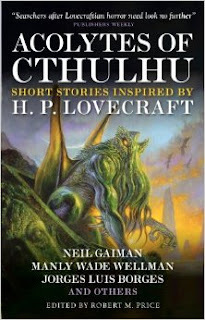 Wellman's name is on the cover of Acolytes of Cthulhu, a volume of Lovecraft-inspired fiction. It's interesting to note that the flood of Lovecraftian stories has not meant any kind of resurrection of August Derleth; he lies dreaming with dead Cthulhu. A single, stately volume of The Complete Amber has closed out the Science Fiction & Fantasy section in Barnes & Noble for as long as I can remember. It's a massive tome and it's always present. The omnibus has been reprinted at least once, because it has a different cover than my copy, but its presence is kind of a fitting bookend to the SFF section. It's sad to note of Appendix N, now a 36 year old list, that of its twenty-eight named authors only Michael Moorcock is still alive. Several of the Swords Against Darkness III authors, including Lee (edited to note: Tanith Lee passed away in 2015), are also with us. Even some of the greats have been moved on from: Andre Norton's books used to fill a respectable slot, but now it skips her entirely. Given the ongoing fandom for Lovecraft, it is somewhat odd that nobody's been putting out any of Dunsany's longer work in good print volumes; The Gods of Pegana, The Sword of Welleran and the other early work is all in the public domain, but I guess it's still not as profitable as the Martian tales. 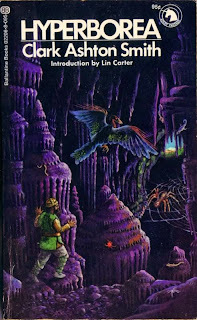 Merritt's work, likewise: we could easily have print versions of The Moon Pool and The Metal Monster, but even his name seems to be lost to the years. Both were major influences on Lovecraft; perhaps someone should lobby S.T. Joshi. Barring a movie or HBO miniseries (or maybe True Detective taking up Manly Wade Wellman's "Silver John" stories), I don't see any grounds for a serious revival of the rest of the Appendix N authors. Burroughs, Lovecraft, Tolkien, Moorcock, and Howard are the anchors keeping Appendix N literature accessible to new generations, and it's probably going to stay that way for a while to come. In a way, that's a damn shame. The best of this stuff is rip-roaring adventure. Norton and Brackett are two of the bigger losses, I think, both being women with a great knack for a science fiction or maybe science fantasy yarn. 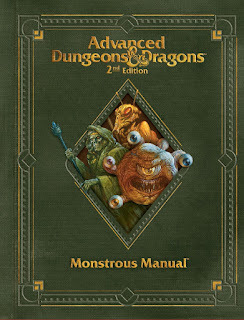 The second edition AD&D Monstrous Manual is now available as a PDF. 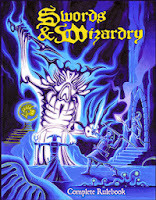 This is part of the AD&D 2e books being made part of the D&amp:D Classics website. Unlike the PHB and DMG, the Monstrous Manual did not get hit with an ugly stick in the 1995 redesign, so it has exactly the same art and layout that it had originally featured two years earlier. The original 2e books featured the Monstrous Compendium, with the idea being that the monster books should be loose-leaf sheets collected in an oversized binder, so new monsters could be added alphabetically instead of keeping them in a growing series of hardcovers. This failed for a simple reason: the monster entries didn't all take up a full page, front and back, meaning that one monster would be on the back of another. If it went from GA to GI, then where the heck do GE monsters fit? It also created a proliferation of loose-leaf monster sheets in boxed sets that would inevitably get lost in the shuffle. Happily, the Monstrous Manual and the Monstrous Compendium Appendix series pretty much fixed this, putting everything "core" into a big hardback and the "expansion" monsters into perfect-bound softbacks. One of the things that you need to remember when looking back at TSR products is that they were laid out first and had content written to fit. This became extreme in the case of the Monstrous Compendium / Monstrous Manual series. Each monster had to take up at least a full page, whether it was needed or not. To facilitate this, sections on Combat, Habitat/Society and Ecology were added to pad out the entries. This is occasionally interesting but often reads like useless filler, which is a shame, as the format has a lot of potential that is occasionally reached. For instance, the Githyanki and Githzerai are extremely well-imagined and well-realized in this book, and the Tarrasque comes off well. But on the whole it doesn't stay at that level, and the format feels bloated. The art, despite happening against a plain white background, manages to evoke creatures that have come from a high-fantasy world with a lot of detail and a touch of whimsy. His new art book Realms is worth the price and shows a great array of his imagination, including sketches that didn't make it all the way to the MM. Shannon Appelcline (who writes the "product history" sections for these books) fails as a historian for managing to not even mention Tony's name when he describes a book that very directly feels Tony's stamp and was critical in starting his career as an RPG illustrator. One game issue in this book that I see primarily as a negative: 2e experienced a lot of "dragon inflation." Dragons were bigger and more powerful in this edition than in previous ones. If you like that, that's cool, but I prefer dragons that fit in dungeons: relatively small, mostly threatening because of their breath weapons, and otherwise very realistic enemies starting at a fairly low level. D&D has trended away from this view, which paradoxically makes it so that you see fewer dragons in adventures outside of the really high levels. If you want to read a monster book cover to cover, this isn't a bad choice. (The appendix books are a better choice, because the focus in the MM is primarily on "standard AD&D" monsters, while the other collections by definition are of new creatures.) The real issue with the book is that it feels like it was written by a committee. This intensive monster format could have been a great way to present a tightly integrated fantasy world, but instead it comes off piecemeal, really not even justifying all of these critters existing in the same universe. Due to the bloated stat entries, it's not very good for at-the-table use, and I switched to the 1e books while I was running a hybrid 1e/2e game in high school. This was my first book of monsters, and I do think it's part of why I like monsters so much. As you've probably figured out, I credit Tony DiTerlizzi with a lot of that. If you've never read the book before, I'd definitely pick up the PDF and give it a whirl. "Pirates are the same as Buccaneers except they are aligned with Chaos." 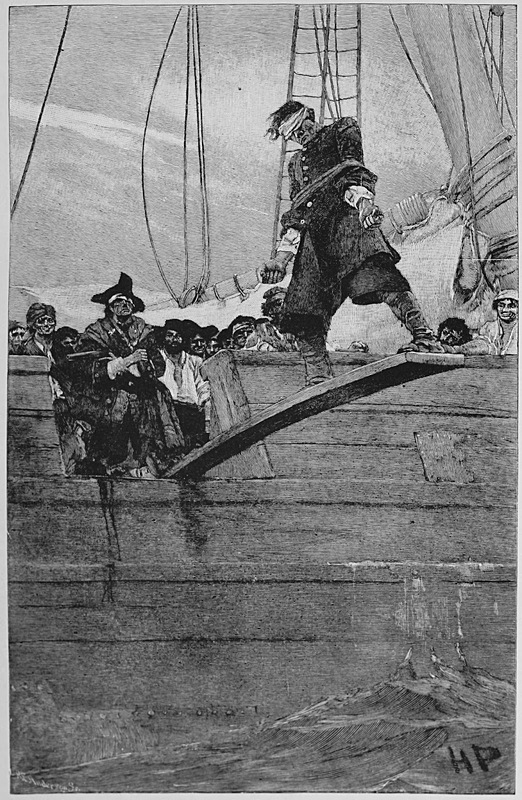 In 18th and 19th century admiralty law, the term hostis humani generis was used to describe pirates. It's a Latin phrase meaning "enemies of the human race," and is used to describe the way that piracy was considered a crime against all nations. In practice, it meant that any nation could capture and hang pirates as criminals, even if they had attacked a ship sailing under another nation's flag. Pirates have lost a great deal of their ferocity in pop culture. A lot of my daughter's cartoons use pirates as lovable, if cranky, sailors who mostly hunt for treasure. Which is a shame, because they're great villains and poor heroes. OD&D devotes very little space to melee combat between dungeon denizens, but it finds eight pages to cover naval combat. There are well thought out rules for exactly how to conduct warfare between medieval ships crewed by men, and combat with water monsters. These are clearly Dave Arneson's creation, and were neglected in later versions of the game – at best considered a minor set of conditional rules. The natural setting for using these rules is an archipelago. Islands are great D&D settings, as recognized by the classic module X1 The Isle of Dread. There is a terrific sandbox resource for island campaigns in Judges Guild's Island Book 1, which contains tables for rolling up an island on the fly, and dozens of detailed hex maps of islands. The islands are also the most expressive part of the Wilderlands setting, as each island on the maps has a unique hook provided. Piracy makes for an interesting cost to an island-hopping campaign. They can be used to make the passage between islands difficult, but if they have a "land base" they can convert readily into a kind of bandits. Pirates don't always need to be disaffected sailors from the main culture, either. "Queen of the Black Coast" by Robert E. Howard features pirates from an African-style setting. The racial implications there are unfortunate, but the basic concept can be made to work with no racial animus. (Indeed, since Vikings are pretty obvious medieval pirates, they might actually be lighter skinned than the main culture.) It also doesn't necessarily follow that pirates have to be human. For instance, many of the tricks used in classic "Tucker's Kobolds" type scenarios would also be effective for taking a ship. And there is just something about a kobold pirate that amuses me deeply. Outside of pirates, there are heaps of monsters, particularly in Supplement II: Blackmoor, that basically beg you to go to the seas. Basically megadungeons solve this problem by putting the sea under the dungeon, but it is inherently limited and doesn't give you the same variety. The sea is an infinite world of fresh horrors, and if you're like me you've probably wondered why they are included. Sahuagin, ixitxachitl, locathah, morkoths, were-sharks, not to mention the plentiful variations on the sea-monster, both real and imagined, all given less love except in the occasional wet dungeon. The reason they are there is that Dave Arneson wanted you to be adventuring at sea. Aside from chances to use the naval rules and the many waterborne monsters, island-hopping just gives you great variety. All kinds of different monsters, cultures and ruins can be found in islands, and it all makes a certain kind of sense. You want Vikings or cavemen? Sure. Want the last survivors of lost Atlantis, with corresponding treasure beneath the waves? They've been on that island the whole time. Primeval tribes, lost ruins, abandoned forts, strange creatures are all fair game. No reason that these islands can't have huge magic on them that has gone unexplored – refer to The Moon Pool or "The Call of Cthulhu" for a couple of Appendix N examples. One of my favorite archipelagos in fiction is in Ursula K. Le Guin's Earthsea. One other source of material for an island-hopping campaign might not seem immediately obvious, but you could certainly adapt the world-generation tables in classic Traveller to give you a few more details on top of the JG island book. After all, a spacefaring campaign with FTL is basically the same as an island-hopping campaign, the scale is bigger and the technology is higher, but the fundamentals are there. Oh, and if you run a naval campaign, someone gets to be Captain. All sorts of fun there. I've been thinking that I'd like to do some more wilderness gaming, and toward that end I've decided I need more random tables for wilderness features. Rather than just write them up for myself, I figure they are good material for the blog. 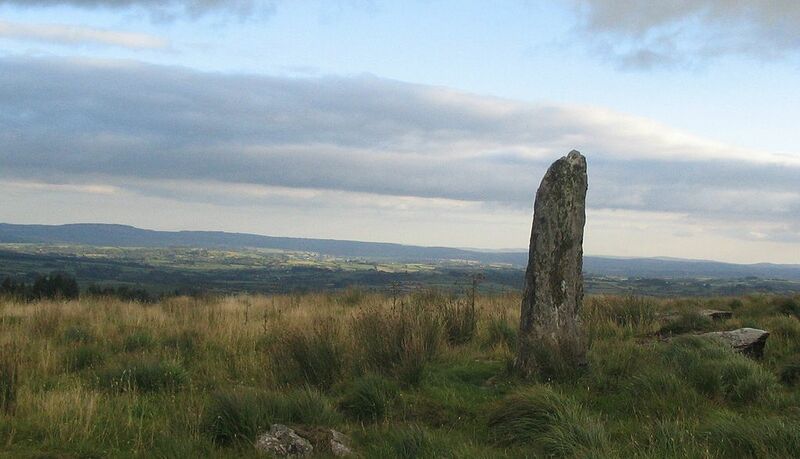 Standing stones are compact, simple things of interest in a wilderness setting. They aren't all weird, but these are some ideas for when the players encounter, and possibly camp out near, a mysterious menhir. The stone is a marker of a ley line. This amplifies the range / duration / effects of spells cast within 120' of the stone by 1.5x. The stone creates a wild magic zone with a 120' radius. Casting a spell in the area has a 1 in 6 chance of creating a wild surge. Several times a year, the stones awaken and walk to a new location. Roll 2d6; if both dice show "6", then today is such a day. It's a giant transformed into stone thousands of years ago. Weather has not been kind to its features but the face can still be made out. The stone covers up the cave-home of a tribe of pixies who come out at midnight. There is a small hole at the base that they come out of. Anyone camping nearby will be vulnerable to their tricks if the hole is not covered up before midnight. It's the meeting-place for a local human or monster faction. The stone was flung out from the fey realm and will give dreams that are both surreal and prophetic to anyone sleeping nearby. The stone is a finger / body part of a long deceased god. Depending on the god's alignment and that of the person touching it, the stone may give a boon (blessing, bonus/advantage on future roll) or bane (curse, penalty/disadvantage). It's a gravestone. The deceased may be attracted back to it either in spectral or skeletal form. It's just a rock. A very unstable rock, that falls on anyone unfortunate enough to get too close to it. 3d6 damage, save for half. Apparently Zak S. added more to the RPGaDAY questions, because you can do that. My answers wound up way more '90s than I expected. Furry Pirates. Quite possibly the trifecta: worst rules, worst setting, worst experience. The spell-creation system in the Dragonlance SAGA game (the one with cards) was clever, although we never did too much with it. Street Fighter: the Storytelling Game. Rifts. It has heaps of concepts that I love, but both the setting execution and the system are pretty much botched. Changeling: the Dreaming. I don't like the White Wolf "feel" (although it appealed to me in college) or the system at all. There were ideas in Changeling I really liked, although the central core idea (resisting Banality) did not work at all. I ran a lot of sessions, and it did click for a couple of games, but wasn't sustainable. It was a half-baked modern fantasy RPG that only worked if you turned your head and squinted just so. But the parts that worked, did work. Over the Edge is old enough to drink, and definitely shows its '90s conspiracy roots. A version that looks more like the modern world would be welcome. OD&D (easier if it's '74 OD&D and I can just grab a map and run). Original D&D. I'd hire James Raggi to produce a single-book edited version in a hardcover with art and layout roughly matching that of Isle of the Unknown. I don't really have anything for this, because I don't go about grabbing house rules. 5e D&D. I was all primed for hating it but then I went and played it. Basic Roleplaying. Either Call of Cthulhu or the big gold book. There are three concept-heavy RPGs from the late '90s that I always wish I'd gotten a campaign together for when I was in college: Blue Planet, Fading Suns and Tribe 8. Over the Edge. Since it doesn't differentiate who gets what dice, you could totally have your sting as a combat skill for 3 or 4 dice. Dungeon Crawl Classics RPG. Has a ton of stuff I'd like, and I particularly enjoy the zine output, but there are a lot of things that hold me back from running it. The crazy dice and different stats I'm fine with; I can even get along with the streamlined d20 system it uses. But the magic system seems like it just wants to take over the game, and make it "about" wizards as if they weren't already big enough in D&D. 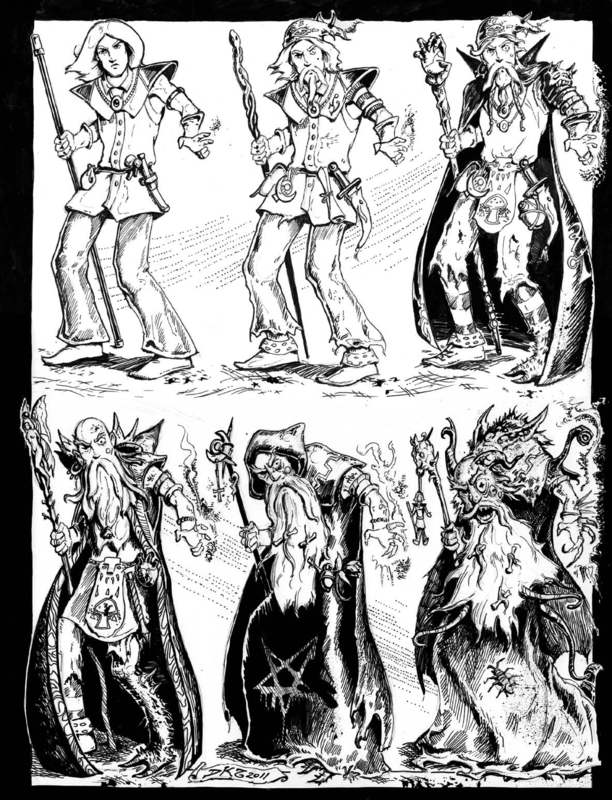 I also think its appeal is primarily to gamers about 5-15 years older than me; namely people who were 12 in the period of the Holmes, Moldvay or Mentzer Basic sets, who switched to first edition AD&D. There is an element of nostalgia that I don't have, and am not quite comfortable with. RPGaDay is a series of 31 questions intended to be answered at the rate of one question a day for a full month. That's too inefficient, so here they are in one day. Enjoy! I am looking forward to the new Delta Green RPG from Arc Dream Publishing. A huge update of the excellent take on modern Cthulhu is very welcome. And it's still using the BRP system, which is really refreshing. Runner-up: Mutant Crawl Classics. Metamorphosis Alpha deluxe edition. The additional stuff from the Kickstarter created a bona fide game line that has deserved to exist for almost 40 years now. You can get in on Epsilon City, the follow-up, right now! Dungeons & Dragons 5th Edition. At the moment it's probably my second favorite flavor of D&D (after OD&D, of course). It has just enough crunchy bits for my taste without really sinking the game. Castles & Crusades, but in a negative way. It read like it would run like I ran AD&D as a 1e/2e hybrid, but the SIEGE mechanic did not work like I wanted it to. Led to me picking up older editions. TSR, Inc. Sorry to OSR folks, but it's TSR with Judges Guild as the runner-up. E. Gary Gygax. Runner-up: Dave Arneson. 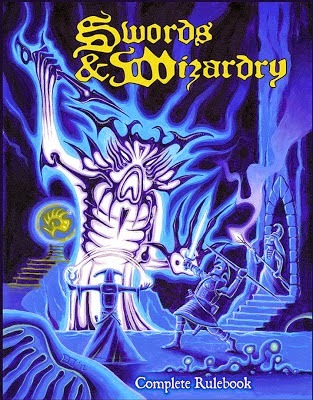 I'm going to go with Erol Otus's cover for Swords & Wizardry Complete. It makes me want to run S&W Complete again. There is a close runner-up that most folks probably haven't seen: the cover by Fred Fields of the Al-Qadim boxed set Ruined Kingdoms. I love that cover, it was one of the very few in the early '90s TSR products that would scream "ADVENTURE!" to me in a totally pulp way. Save or Die! The current rotation are my favorites. My Gamescience dice. I refuse to roll online even in Roll20. The AD&D (1e/2e hybrid) Greyhawk campaign I ran in high school. It ended with an epic fight on the planes of Air and Concordant Opposition. FASERIP Marvel Super Heroes. We played a ton of this in high school. World of Greyhawk (pre-Wars). Close second, Wilderlands of High Fantasy. My parents' dining room circa 1998. My parents have a beautiful wood table, that for reasons of not destroying we put a pad over. (I did have to yell at my friends if they leaned back in the chairs.) It could easily seat 8 players, had French doors at one end and opened into the living room on the other. There were always 3 bags of chips, 3 bottles of soda, a ton of books and dice. I've had plenty of gaming environments since, and I do hope to get to run games at the kitchen table in my house once my daughter's a bit older, but I loved running in that dining room. Critical hits. I've houseruled them lots of different ways and done the most with them. Charts, max damage, double damage dice, pretty much any excuse for me to switch from "okay, you do 3 damage" to "ok, the goblin is now pinned to the tree by your arrow" or "you take its head clean off." Karma, FASERIP Marvel Super Heroes. The idea that you got points for being a good super-hero was actually really important given that we were playing FASERIP in the grimdark '90s. Mostly pictures. I can't draw, so I really riff off of images I can expand in my head. Metamorphosis Alpha and OD&D are very compatible. 31. Favourite non-RPG thing to come out of RPGing I'm not sure what the question means, but I like swords, and I blame RPGs for that. So let's go with swords. Alchemist: Given a formula, the Alchemist can duplicate it to make a similar potion at a cost of one-half the potion's value. 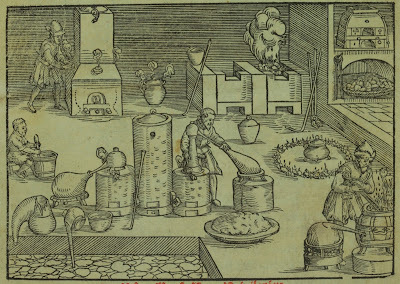 Alchemists may conduct research, but the time and expense are twice that of a Magic-User, and they may only work on poisons. Specialists, which have been part of the game since 1974, are one of the more neglected ways to spend money in Dungeons & Dragons. Which is a shame, because they are both a good way to remove excess gold pieces, and a powerful tool for world-building. U&WA specifies that specialists are available "to those in positions of power, i.e. with their own strongholds." This suggests an atmosphere like the famous Italian patronage system, where the rich and powerful sponsor alchemical laboratories to their benefit. They are joined in this by the intriguing Sage type, who have the stipulation: "They are employable only by Fighting-Men." This is a curious requirement that fits in with Supplement II: Blackmoor's idea that Sages are regulated by a Guild, which is jealously guarding its knowledge from wizards and priests, who it logically sees as "the competition." 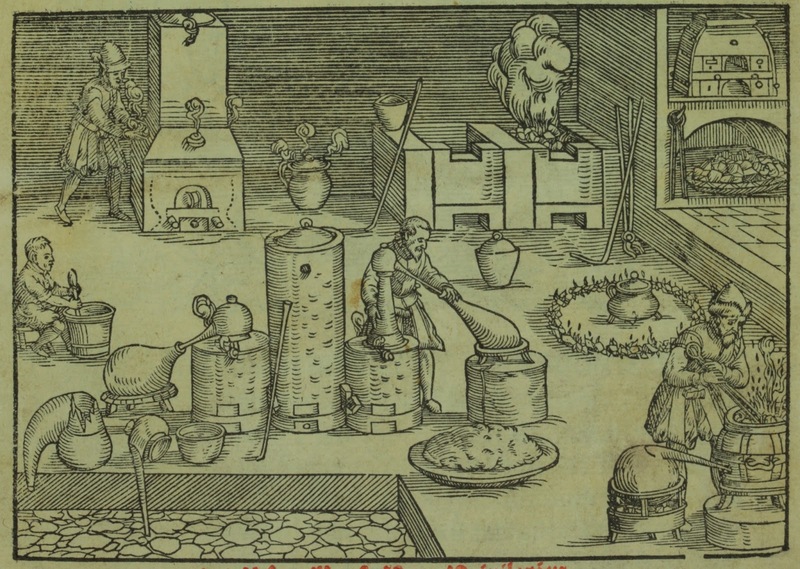 Alchemy was an interesting mix of chemistry, astrology and occultism, influences that play an unfortunately small part in a lot of D&D. I think there's a particular richness to working it into a background – although perhaps not so subtly so that it gets missed. The overlapping alchemical and astrological symbols are a rich visual vocabulary for a D&D game. One of the advantages of this approach is that it solves the reference problem where the players don't have knowledge their characters should have. By using our world's alchemy and astrology for that of the fantasy world, you create an accessible basis for things like clues, puzzles and riddles in the dungeon that both the players and their characters can and should understand. Of course you could create your own as well, but it seems intriguing enough to me to insert references to these patterns and ideas in the D&D world.